Step inside Sudnya Shroff’s cast-concrete home in Los Altos Hills, Calif., and you will find glossy kitchen countertops, also made of concrete, sculptural bathroom sinks and staircases—concrete—and floors with fossils and tiny semiprecious stones embedded in, yes, concrete. 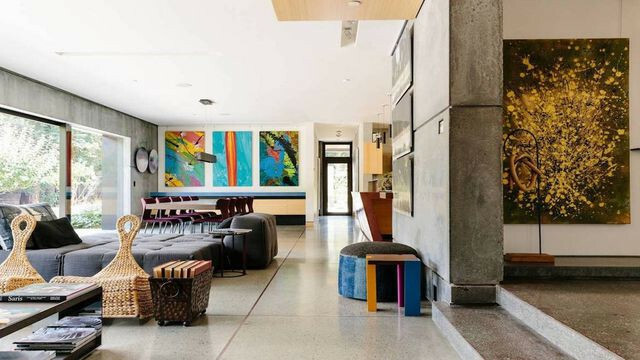 “There’s a very strong emotional draw for me toward concrete—it’s the one material that accepts imperfections,” said Ms. Shroff, a 44-year-old painter and fashion designer whose 7,000-square-foot home, completed in 2013, cost over $5 million to create. Her husband, Nickhil Jakatdar, a 46-year-old Silicon Valley entrepreneur, had his doubts during the 4½ years it took to design and build the house. “He said, ‘Is it going to look like one of those homes in India, where they run out of money and don’t paint?’” she recalled. Unfazed by associations with cellblocks and parking garages, more homeowners are discovering that concrete is the chameleon of construction. It can take on the texture of wood or glass, an artist’s palette of color beyond drab gray and, with the addition of structural fibers and plasticizers, is less prone to cracking. Concrete has been around since ancient times, when Roman builders mixed lime, sand and rubble with volcanic ash to create the Pantheon dome. Modern concrete swaps out the volcanic ash for portland cement. Concrete homes can be poured in place into forms made of plywood or steel plate and lined with everything from pine boards to mirror-smooth plastic laminate. Or they can be erected using precast concrete walls or blocks. The sturdiest concrete homes are reinforced with steel, making them strong enough to withstand fires, floods and hurricanes. For the Shroff-Jakatdar home, Mr. Cheng created a cantilevered staircase with concrete treads that seem to float in midair; each tread can support over 900 pounds. Elliptical circular “cutouts” throughout the house bring in natural light. The concrete floor of Ms. Shroff’s studio was stamped with traditional Indian and Chinese blocks used for textile printing. A view of the dining area. The paintings are by Ms. Shroff, an artist and fashion designer. And her deep-red kitchen counter, tinted with powdered iron oxide, was poured in place and then buffed to a high polish to resemble terrazzo. Concrete homes are typically more expensive to build than conventional homes, but they’re less expensive to maintain and more durable over time. Concrete affects the bottom line in other ways, lowering heating and cooling costs and even insurance premiums. “Reinforced-concrete building systems are more disaster resistant, more insect resistant, more mold resistant—also one of the most energy-efficient systems available,” said Ed Hudson, director of marketing research for Home Innovation Research Labs, a subsidiary of the National Association of Home Builders, a trade group. Front entrance looking toward the office of the Shroff-Jakatdar home. According to Home Innovation surveys, poured and precast concrete is most popular in the luxury sector—accounting for 4.1% of high-end homes built last year. That marks a steady increase in the demand for luxury concrete since the recession low in 2012, when such homes accounted for just 1.9% of new construction. 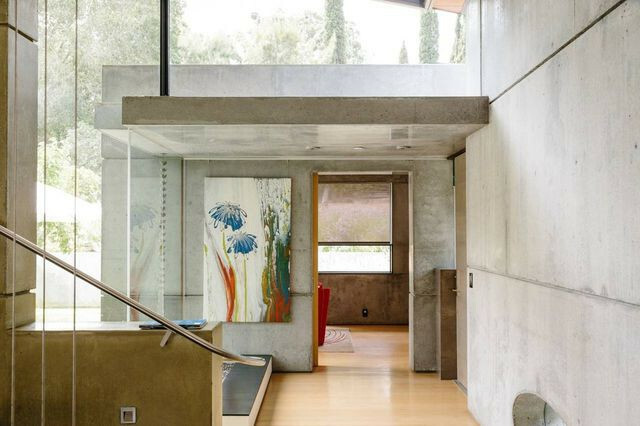 Investing in concrete construction with high-end finishes may pay off in resale value. In New York, Tod Greenfield spent over $2 million to build a 5,000-square-foot concrete house that was poured in place on his family’s 3¾-acre property on the North Shore of Long Island in 2013. “We didn’t want to use Sheetrock, we didn’t want to use paint—because every few years you have to repaint,” said Mr. Greenfield, who is 58 and the co-owner of Martin Greenfield Clothiers, a custom-suit manufacturer. Custom wooden forms were created to cast the concrete walls, floors and ceilings. Pine boards were used to give the concrete walls a wood-grain finish, which harmonize with the home’s black-locust siding (milled from trees on the property felled during Hurricane Irene). The smooth concrete ceilings were created with fine-planed plywood forms. Large windows and translucent polycarbonate wall panels bring in plenty of light. The exposed concrete ceilings posed a challenge: Where to hide some of the home’s wiring and other elements. Narofsky Architecture, which designed the house, created a series of wood-framed “clouds” that float just below the ceiling, to house cove lights, speakers, air-conditioning vents and venting for the kitchen cooktop. Each cloud is lined with a sound panel made of polypropylene material, “to balance out the echo and soften the audio feel of the house,” said principal Stuart Narofsky. A look inside the Greenfield’s concrete living room. The concrete roof is strong enough to support a 150-square-foot rooftop vegetable garden in raised beds planted with a foot of soil, and a 1,000-square-foot green roof of alpine plants. But not all concrete is built to last. In the Los Altos Hills, Calif., home, Mr. Cheng designed a wall that has been engineered to partially erode over time; the concrete, which was mixed with soil and organic matter to encourage the growth of lichen and moss, is also embedded with hidden objects, such as stones, machine parts and a doll belonging to Ms. Shroff.